Check, Please! Bay Area features guests and eateries as diverse the Bay Area itself. With each episode of the James Beard and Emmy Award-winning program, three local diners are cast as restaurant critics and share their favorite spots. In every Check, Please! 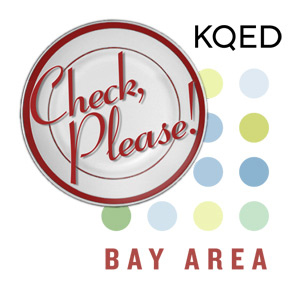 episode, each guest chooses their favorite place to eat and the other two guests visit anonymously - the restaurants are not notified that Check, Please! "reviewers" are dining there. After trying each other's recommendations, they join host and moderator Leslie Sbrocco to discuss, dispute, and celebrate their dining experiences with lively commentary. Our first eatery features a market-driven menu created by a world-class chef; Madcap is an intimate spot in San Anselmo named to represent the frenzied atmosphere of a professional kitchen. With authentic Mexican fare and a festive feel, El Toreador is so colorful and vibrant, you almost need sunglasses when you walk in the door of this San Francisco spot. Our final pick is an East Bay eatery named for the chef's mother and grandmother. Juanita and Maude draws diners from all over the Bay Area to this Albany neighborhood favorite. Flea Street Cafe in Menlo Park embraces fresh Californian cuisine produced from local, organic ingredients, some even grown right at the restaurant. Metro Lafayette merges urban sophistication with a relaxed suburban attitude and a Californian-French menu in Lafayette. Marin Sun Farms Butcher Shop and Restaurant combines a farm outlet, butcher shop and restaurant celebrating the pasture-to-plate philosophy in Pt. Reyes. Transformed from a bank, an auto shop and a chain restaurant, these eateries now accommodate amazing menus crafted by passionate chefs. North of the panhandle in San Francisco is Nopa, a hip, late-night restaurant perfect for meeting new friends. Mua in Oakland's place to experience live DJs, an internationally inspired menu and crave-worthy cocktails. And La Costanera Restaurant in Montara serves up contemporary Peruvian cuisine and ocean-front views in Montara. Backpacking through the Bay Area offers a chance to savor traditional European cuisine. First stop is the classic French menu at L'Ardoise Bistro, a dreamy, neighborhood spot tucked away on a tree-lined street in San Francisco. Then, imagine a villa courtyard in Central Italy as you step into the greenery-draped trellises and taste the family recipes at Della Santina Trattoria in Sonoma. Finally, savor the cuisine of Piemonte and Liguria in the warmly lit, contemporary-styled dining room of Perbacco in San Francisco. We begin with Z&Y Restaurant, one of the hottest Sichuan restaurants in San Francisco, known for catering to tourists, locals, presidents, and foreign ministers alike. Our next eatery is in San Mateo and designed with leisure in mind, so turn off your phone and leave your laptop at home when you dine at Pausa. Our final pick, serves stick-to-your-ribs-hearty-fare with southern hospitality. You'll be impressed with their meatless menu when you taste the Louisiana-creole-style vegan soul food they offer at Souley Vegan. First we visit a Scottish-themed farm-to-table eatery at Martins West Pub in Redwood City. Then a family-gathering place with hearty portions of Russian cuisine at Red Tavern in the Richmond District, SF. And lastly, a contemporary twist on Indian fare with inventive California cocktails at August (1) Five in San Francisco. Sit outside with the locals and enjoy hookah by the water at Foster City's Waterfront Pizza and Mediterranean Restaurant. Then, stop in for pastrami and matzo ball soup at East Coast meets West Coast deli-done-Berkeley style, Saul's Restaurant & Delicatessen. Finally, dig into wood-fired meat, meat and more meat at San Francisco's Lolinda. Southern hospitality is not all that is offered on the menu at tucked away Rusty's Southern in San Francisco's Tenderloin. Neither is it just pizza and beer served up around the fire-pit at Jupiter in Berkeley. But we continue within the galaxy to the elegant wood-fired dishes at culinary comet Glen Ellen Star in Sonoma County's Glen Ellen. Find elevated Mexican cuisine at CALA's in San Francisco where you'll find sustainable fish and high-end tacos and a philanthropic mission. Meanwhile, Moss Beach Distillery in San Mateo County, offers seafood, views and otherworldly cocktails! Then it's back to the Wild Wild West at Valley Ford's Rocker Oysterfeller's Kitchen + Saloon for oysters and southern comfort food. This week we start off at Thirsty Bear Brewing Company, a San Francisco brewery known for craft beers, small plates and flamenco dancing. Next we travel to Nick's Cove in Marshall, a historic waterside retreat serving up fresh seafood and locally grown produce. Our final pick is Middle East Market in Berkeley, where you can not only dine in at the Persian cafe, but if inspired, buy the ingredients and make the meal yourself at home. Burmese flavors take us to Burlingame this week with stir-fry dishes that are neither too hot nor too spicy at Mingalaba Restaurant. But if you get a late-night hankering, while you're in the Cow Hollow district of San Francisco, the pub favorites at The Brazen Head are sure to hit the spot. Finally, we end with a love letter to the islands in the form of elevated Hawaiian cuisine at '?ina in San Francisco's Dogpatch. Sauerbraten, schnitzel and traditional German fare at Speisekammer German Restaurant in Alameda take the lead in this episode. Then it's back to breakfast and Southern-style comfort food at Kate's Kitchen in San Francisco... until we finish in San Jose's "Little Portugal", with a Michelin-starred destination serving Portuguese cuisine, called ADEGA. We start with a sip of sherry and savory bites from Spain at La Marcha Tapas Bar in Berkeley. Then we globetrot to Southeast Asia for a bowl of Drunken Noodles and more, in the contemporary environ of Arun Thai in Novato. Finally, we indulge our Cal cuisine cravings at Copper Spoon Cocktails & Kitchen in Oakland. Our first restaurant, Trattoria da Vittorio in San Francisco, features Calabrian-influenced Italian cuisine inspired by the chef's iconic matriarch. Up next is Jin Sho in Palo Alto, a Japanese eatery that strives to serve only the freshest and highest quality ingredients. Our final stop is San Jalisco in San Francisco's Mission district, a popular Mexican spot known for serving up unforgettable soups. Americana at its most flamboyant is on display at the Silicon Valley neighborhood eatery Buck's of Woodside. Huge bowls of steaming noodles take center stage on the Laotian style menu at Noodles Pho Me in San Leandro. Then New American cuisine is the name of the game at Gardenias Restaurant in the Fillmore District of San Francisco. Bubbles, wine and southern smoked ribs make for a winning combination at Bounty Hunter Wine Bar & Smokin' BBQ in downtown Napa. Next it's Parisian classics like steak frites, coq au vin and duck confit at REVE in Lafayette. Finally, we settle in to a hip Italian spot with wood-fired pizzas at Fiorella in San Francisco. From playful seals and stunning sunsets to classic cocktails and elegant cuisine, San Francisco's historic Sutro's at the Cliff House has it all. And due to a fire at our second eatery, we only feature two restaurants in this show. Our second spot takes us to a place that evokes the musical call of tree frogs and dreams of tropical flavors in a lively setting at El Coqui Puerto Rican Cuisine in Santa Rosa. We start in Sebastopol, where we celebrate the bounty of the North Bay at zazu kitchen + farm, a quintessential farm-to-table restaurant known for its localvore approach. Then it's off to Oakland for juicy, umami-laden chicken at punk-rock-influenced Aburaya, a restaurant serving Japanese fried-chicken that's to die for. And finally we'll take you to a spot in San Francisco that's very romantic, a place for blind dates...or even wedding receptions; it's a Mission-district Italian eatery called Locanda Osteria & Bar. Mezcal, mole and a "muy especial" vibe will have you saying "si" to salsa and spicy sips at Agave Uptown in Oakland. Next, serving up rustic pastas, Fairfax's Sorella Caffe is a family-friendly, homey eatery that's stayed true to its roots. Finally, One Market Restaurant pioneered farm-to-table cooking long before it was trendy. Just steps from the Bay, it's been an epicurean's haven for more than twenty-five years. We begin at a mom-and-pop run bakery that supplies breakfast, brunch and lunch - all made in-house, from scratch, at Noe Valley Bakery in San Francisco. Next, we head down to Santa Clara for a traditional Greek menu complete with checkered tablecloths, bold flavors, and flowing wine at Athena Grill. To complete the trio, we land at a spot that combines Indian, Punjabi and Mexican flavors - made with Californian ingredients at Avatar's Restaurant in Sausalito. Slow-cooked, smoky meats straight from the wood-fired bbq pit are the star attraction, in San Francisco, at 4505 Burgers & BBQ. Next, ramen and Japanese pub dishes made with local farm-fresh ingredients draw a dedicated crowd at Ramen Gaijin in Sebastopol. Finally, take a trip back in time as we're transported to 1930's Shanghai for an opulent dining experience, choreographed in style at Eight Tables by George Chen. It's Italy-meets-Louisiana-meets-backyard BBQ at this kid-friendly spot with great pizza and space to play, in San Francisco at All Good Pizza. Then we uncover authentic Liberian cuisine, a rare culinary find, at Kendejah Restaurant in San Leandro. And finally, enjoy the warm welcome at Siam Bay Authentic Thai Cuisine in Oakland, where they make you feel a part of the family. We kick off our week of vegetarian-friendly restaurants in Berkeley with vegan delicatessen The Butcher's Son. Next up is Sol Food, a Marin County hot spot where Puerto Rican cuisine offers a wide variety of delectable choices to delight the vegetarian palate. Finally, we take you to Al's Place in San Francisco, where vegetarians have an abundance of options to choose from on its seasonal omnivore menu. Fragrant dishes hailing from the Himalayas entice and welcome you to Cuisine of Nepal Restaurant in San Francisco. Then, Mexican family recipes are served up in a kid and dog-friendly space at Mama Coco Cocina Mexicana in Menlo Park. Finally, winery vistas, elegant Californian cuisine and warm hospitality settle us into The Restaurant at Wente Vineyards in Livermore. Authentic Portuguese flavors take us to our first spot, Uma Casa Restaurant in San Francisco. And it's in San Francisco, where we stay for the seasonal Indian-cuisine-with-a-twist, that's served up at Ritu Indian Soul Food. Finally it's all about cheesy macaroni, in all its glorious variations, at Homeroom Mac + Cheese in Oakland. We begin at a local institution, where the food is served cafeteria-style; be ready to order at Tommy's Joynt in San Francisco. Our next destination is led by a Milan born chef offering a fresh, elegant take on Northern Italian cuisine; relax at Belotti Ristorante e Bottega in Oakland. Last, we visit a contemporary steakhouse serving prime cuts from around the world right here in in San Francisco; tuck into the meat at 5A5 Steak Lounge. Family recipes and traditional Thai ingredients balance the flavors of hot, sour, salty and sweet at our first spot - Lers Ros in San Francisco. Then the focal point shifts to the red chiles of China's central region in Pleasant Hill at Sichuan Fortune House. Finally we end with a menu focused on a Latin-American blend of lusciousness, along with a killer tequila list, at Marinitas Restaurant in San Anselmo. This week we start off at Honor Kitchen & Cocktails in Emeryville, an esteemed bar and restaurant with exceptional cocktails, delightful bar bites and films projected on the walls. Next is Pleasanton's De La Torre Trattoria; a local dining spot and the kind of family-owned restaurant you might come across in Italy. We conclude with Ichi Sushi in San Francisco, known for its commitment to sustainability and sourcing the freshest ingredients to create seasonal dishes. We start with a taste of Mexico at a crowd-pleasing eatery using local ingredients at The Little Chihuahua Mexican Restaurant in San Francisco. Then cross the Bay Bridge to an Alameda haven, where the patio, water views, and family recipes made contemporary, join plentiful cocktails at Dragon Rouge Restaurant. Our last stop takes us back to San Francisco to a long-established, family-owned spot in the Mission; find fragrant spiced flavors from India at Aslam's Rasoi.